Hillary Rodham Clinton was the first Secretary of State to declare the subjugation of women worldwide a serious threat to U.S. national security. Known as the Hillary Doctrine, her stance was the impetus behind the 2010 Quadrennial Diplomatic and Development Review of U.S. foreign policy, formally committing America to the proposition that the empowerment of women is a stabilizing force for domestic and international peace. 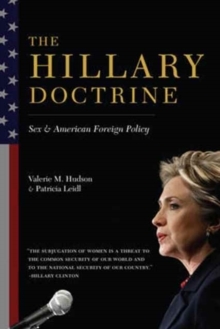 Blending history, fieldwork, theory, and policy analysis while incorporating perspectives from officials and activists on the front lines of implementation, this book is the first to thoroughly investigate the Hillary Doctrine in principle and practice. Does the insecurity of women make nations less secure? How has the doctrine changed the foreign policy of the United States and altered its relationship with other countries such as China and Saudi Arabia? With studies focusing on Guatemala, Afghanistan, and Yemen, this invaluable policy text closes the gap between rhetoric and reality, confronting head-on what the future of fighting such an entrenched enemy entails. The research reports directly on the work being done by U.S. government agencies, including the Office of Global Women's Issues, established by Clinton during her tenure at the State Department, and explores the complexity and pitfalls of attempting to improve the lives of women while safeguarding the national interest.